Remove resolutions from drivers list? Discussion in 'Videocards - NVIDIA GeForce Drivers Section' started by mackanz, Jan 28, 2019. I would like to add a custom resolution instead of using that resolution from the drivers original list. Reason is that certain games (in this case PUBG) doesn't support 4:3 unless they come from custom resolutions in the drivers list (you know, 1728x). As you can see in the picture, i would like 1920x1440, but i can't add something to customs that is already in the drivers. You can do this with 1080p panels by adding 1728 custom, then into the game. Anyone that knows how to? Agent-A01 and INSTG8R like this. 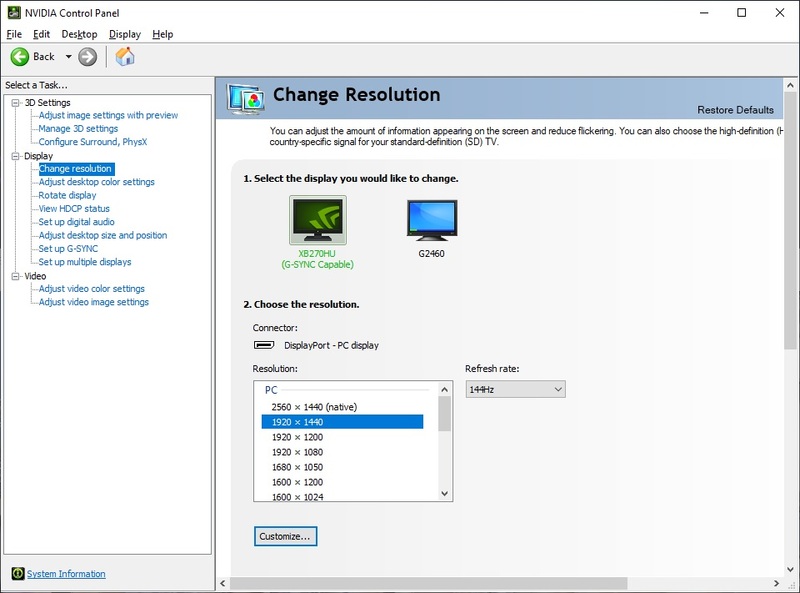 If I recall correctly all you need to do add a custom resolution of the same resolution already in the list is to change the refresh rate on the custom resolution. In your case, since you're at 144hz pretty much anything below that would work. Hmm..i made 1920x1440 in CRU then. I still can't find it in PUBG. Thanks for the reply both. I have actually tried a different refresh too. Ah...so the issue is the custom resolution is not showing up in PUBG? The issue is that the custom resolutions DO show up in PUBG, but i can't add 1920x1440 to the custom, cause they are already a "standard" resolution in the driver, which does not show up in PUBG. But if you add 1728x1080 to custom, they show up in PUBG. I want to remove 1920x1440 from Nvidia somehow, then add them to custom manually. use CRU to remove it from your display edid. Reset driver. 1440x1080 should no longer be there. Add it as a custom res in NVCP instead. Can't you set PUBG res in an ini file or something and set it to read only though? It's a UE game and those usually respect that change. I'll try and see if i can manage it with CRU then. Thanks.